It’s Friday night (or any night) and no one feels like cooking. Or maybe a breakfast out on the town is on the menu. Our 2017 list of best places to eat and drink in the Kootenays, as chosen by our readers, will help you decide where to go. Some restaurants on this list are multiple award-winners, like Jimmy’s Pub & Grill in Creston, the Heritage Inn’s Skylight Cafe in Cranbrook, the Bluebelle Bistro & Beanery in Kaslo and (with a whopping 14 awards!) the Wooden Spoon Bistro & Bake Shop in Grand Forks. 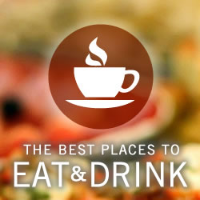 But don’t forget the restaurants that are new to town and new to the list. Places like Soul Food in Cranbrook and Simmer Down Cafe in Fruitvale are well worth a visit too. Franchise outlets like Tim Hortons and Dairy Queen are ever-popular, but quite often the locally owned mom-and-pop establishments edge out the franchises in number of votes. Wherever you choose to dine out—bon appetit!